Project Leaps Past Shipment Milestone, Delivering Economic Benefit to U.S.
RICHLAND, Wash. – DOE contractors have completed cleanup of F Area, the first reactor area at the 586-square-mile Hanford site to be fully remediated. F Reactor was the third of Hanford’s nine plutonium production reactors built along the Columbia River to produce plutonium for the nation’s defense program during World War II and the Cold War. The reactor operated from 1945 to 1965. F Reactor during operations in 1956. F Reactor Area in July 2012. 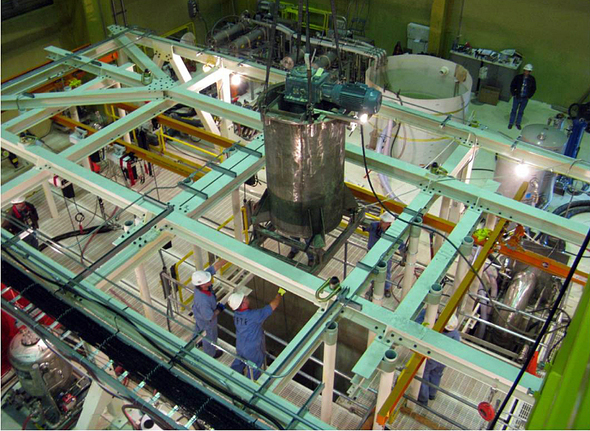 In 2003, F Reactor was placed in interim safe storage, a process known as “cocooning.” The reactor was torn down to little more than its radioactive core, sealed and reroofed to let radiation decay to more manageable levels over 75 years. 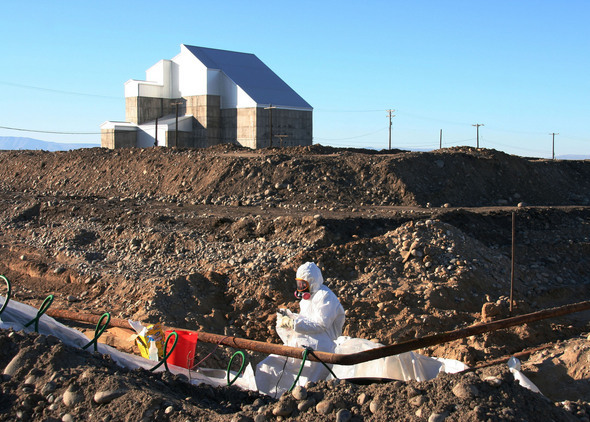 While six of Hanford’s reactors have been cocooned, F Area is the first to have all of its associated buildings and waste sites cleaned up. To complete the mission, contractors combined to demolish 112 facilities and remediate 88 waste sites, removing about 1.5 million tons of contaminated material from the two-square-mile site. The majority of the waste was packaged and transported to central Hanford’s Environmental Restoration Disposal Facility for permanent disposal. A worker cuts and drains pipe at a waste site in F Area. The pipe contained sodium dichromate, which was used as an anti-corrosion agent. 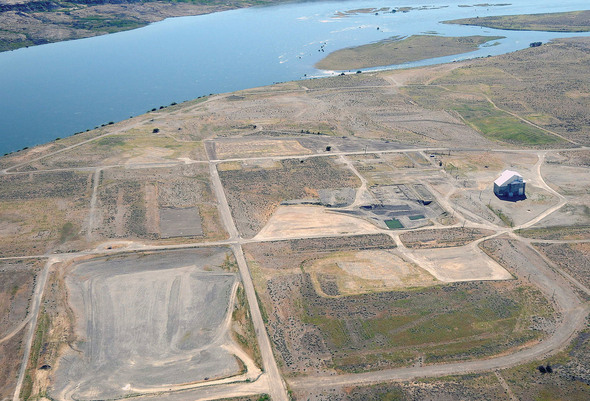 Washington Closure Hanford, which manages the River Corridor Closure Project for Richland Operations Office, completed the final two phases of cleanup of F Area by remediating 55 waste sites and removing 646,000 tons of contaminated material. The River Corridor is a 220-square-mile area along the Columbia River. Some of the waste sites were large burial grounds containing contaminated soil and debris. Workers also found anomalies, including bottles, drums, high-pressure cylinders, spent nuclear fuel and high-dose irradiated items. Some of the anomalies required special methods to sample and characterize the material, which called for additional hazard controls to ensure worker safety. 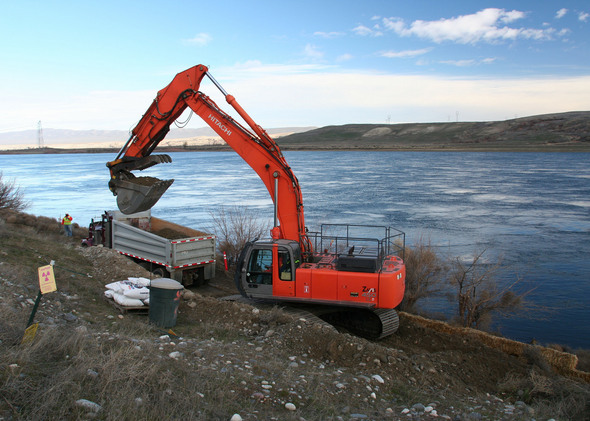 An excavator scoops out a section of river outfall pipeline at an F Area waste site. 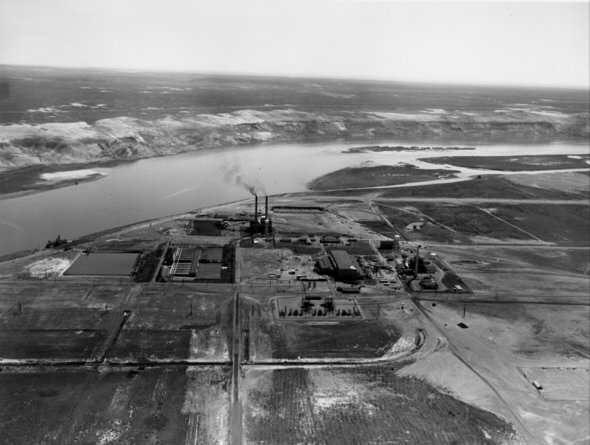 The pipeline was used to discharge effluent into the Columbia River. One waste site required workers to dig to groundwater, about 47 feet deep, to remove soil contaminated with chromium. 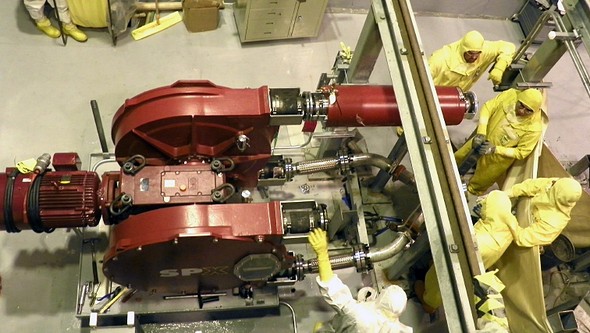 Sodium dichromate, a chemical used as a corrosion inhibitor, was added to the river water to cool the reactor. While cleanup of F Area is complete, workers will return to the site this fall to revegetate areas that were disturbed during cleanup. They will plant vegetation that is native to the Hanford site and has the best chance for survival. What will remain at the site, aside from the cocooned reactor, is a concrete clearwell about the size of a football field that was used to hold filtered water for cooling the reactor. While preparing to demolish the below-ground structure in 2006, workers discovered the clearwell had been invaded by tiny bats. Today, the structure is home to about 6,000 Yuma bats that roost from March through October. It is the largest known maternity colony in eastern Washington. RICHLAND, Wash. – The Richland Operations Office and contractor CH2M HILL Plateau Remediation Company successfully removed a portion of a highly radioactive sludge from underwater storage in a large basin adjacent to the K West reactor at the Hanford site this month. In that milestone, workers removed sludge originating from knock-out pots, which captured coarse sludge during fuel washing activities. Successful removal required extensive mock-ups for testing and operator training. Testing and equipment simulations ensure first-of-a-kind technological processes for sludge removal can be conducted safely and efficiently. The sludge originated from corrosion of spent reactor fuel stored in the basin and other debris left over from plutonium production operations more than 30 years ago. The basin is located about 400 yards from the Columbia River, so removing the material and closing the basin are top priorities for DOE. Elimination of the sludge reduces environmental risks and enables demolition of the basin. Since 2008, DOE and CH2M HILL have been working to develop the best approach for this first-of-its-kind project to treat, package, and remove the sludge for safe storage. CH2M HILL engineers have been developing innovative technologies and modifying equipment to get the job done safely on the first attempt. The Richland Operations Office and CH2M HILL are currently focused on emptying the remainder of the basin’s sludge. About 35 cubic yards of sludge is stored 17 feet underwater in the basin. The water keeps the sludge particles cool and acts as protective shielding to workers. That challenging project requires the development of special retrieval technologies, including mock-ups for testing and operator training to ensure the work will be accomplished safely. Availability, knowledge and responsiveness of project staff during the assessment. The TRA review team concluded that the critical technology elements for the first phase of the project have attained a sufficient technology readiness level and demonstrated a high level of confidence for successful operations. With the completion of this successful assessment, the project is now focused on final design, procurement and installation of the systems necessary to retrieve and transfer the remaining sludge. WASHINGTON, D.C. – Traditionally, a platinum anniversary marks 70-years. The Manhattan Project legacy reached that special milestone this summer, highlighting a remarkable history involving the Oak Ridge and Hanford sites and Los Alamos National Laboratory. Bipartisan legislation making its way through Congress could commemorate America’s atomic history by turning these sites into a national park, a prospect that continues to gain national and international media attention in print, online and on TV and radio. Today, thousands of scientists work in those labs on unrelated research, developing pioneering technologies used for Mars exploration, chemotherapy, whole-body X-ray scanning at airports, "high-speed computers and biotechnology. This work is a legacy of the brilliant scientists who worked at the sites during World War II, Energy Department officials said. Now, some 70 years later, a bipartisan initiative seeks to designate these three sites as a National Park. That’s a fine idea. Such a move would expand access to these crucial historical sites as well as provide funding and staffing to preserve them. Given their importance in the histories of the United States, the Cold War and the 20th century, Congress should pass the park designation bill by Sen. Jeff Bingaman (D-N.M.) and companion legislation by Rep. Doc Hastings (R-Wash.). "This is our story, and the way that things were done in Oak Ridge. It's about the people that were here. The people's story is fascinating," she said. "The average age was 27 years old. No one knew what they were doing. They came here with a purpose, which was to help the war effort. I think there's more to the story than we built a bomb here." A bill to establish the Manhattan Project National Historical Park did not receive enough votes to the pass the House of Representatives. Given bipartisan support for the measure, the legislation may come before the House again for another vote. Portsmouth, Paducah Project Leaps Past Shipment Milestone, Delivering Economic Benefit to U.S.
LEXINGTON, Ky. – The company that operates DOE’s depleted uranium hexafluoride (DUF6) conversion facilities marked a milestone in September when it shipped the one millionth gallon of hydrofluoric acid. Babcock & Wilcox Conversion Services (BWCS) continues to deliver more of the acid to Solvay Fluorides for industrial use through a contract with DOE. Sales of the solution will return million of dollars in revenue to DOE and provide economic benefit to the agency and American taxpayers in the years ahead. 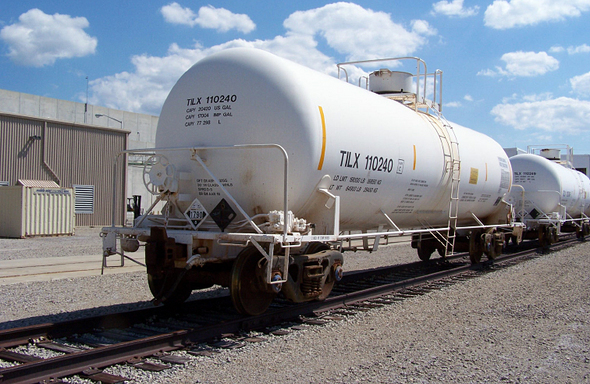 Pictured here are railcars carrying tanks of hydrofluoric acid for shipment from the Portsmouth site to Solvay Fluorides for industrial use. The acid is a product of the conversion of DUF6 to a more stable form for ultimate disposal. DOE constructed two plants to convert the nation’s inventory of DUF6, a residual product of the nation’s uranium enrichment programs at the gaseous diffusion plants in Paducah, Ky. and Portsmouth, Ohio. More than half of the one million gallons were shipped from the conversion facility in Portsmouth, and the remainder came from the one in Paducah. BWCS recently announced the operation of all seven conversion lines at both plants for the first time. The plants have been in startup mode and partial conversion operations since they began ramping up in fiscal year 2012. DOE’s strategy is to bring the plants to full potential throughput in the year ahead. The Paducah and Portsmouth sites together have more than 780,000 metric tons of DUF6 to convert. The plants were designed to operate for 25 years or more to convert the extensive inventory. PIKETON, Ohio – As the Portsmouth site begins to clean up its former uranium enrichment facilities, work is under way to decontaminate and decommission (D&D) the antiquated coal-fired steam plant there. Two steam boilers were recently installed as part of a new natural gas-fired steam plant. The new natural gas based boilers are more efficient and produce less pollution than the old coal-fired system, which served the site for nearly 60 years. In addition, the cost savings from the natural gas system could be more than $2 million in the first year of operations. Project crew members help place the second boiler on a concrete pad as part of the installation of a new natural gas-fired steam plant at the Portsmouth site in Piketon. The DOE is preparing for the anticipated D&D of more than 400 buildings and systems used in the former gaseous diffusion plant following their role enriching uranium for a half century for the nation’s defense and the nuclear power industry. The new steam plant was designed with a capacity to meet the site’s heating needs now and in the future. The old plant has three coal-fired boilers that were manufactured in 1953 and designed to produce more than four times the needed steam to heat the plant’s facilities. Due to its age, escalating maintenance costs, reliability issues — in addition to the pending enactment of more stringent environmental regulations — the coal-fired plant would not continue to efficiently meet site demands. It will be removed next year after the natural gas-fired plant is operational. The DOE prime contractor for cleanup work at Portsmouth is Fluor-B&W Portsmouth. Crews from Geiger Brothers Construction, a local sub-contracted firm, and Fluor-B&W Portsmouth project management prepared for installation of the steam boilers by putting infrastructure in place and rerouting steam lines to support the new system. Installation of the boilers was completed in early September and testing and startup of the facility was scheduled to follow. Typically, steam boilers arrive with the burners already attached. In this case, the burners were installed onsite, which saved up to three weeks of assembly time. 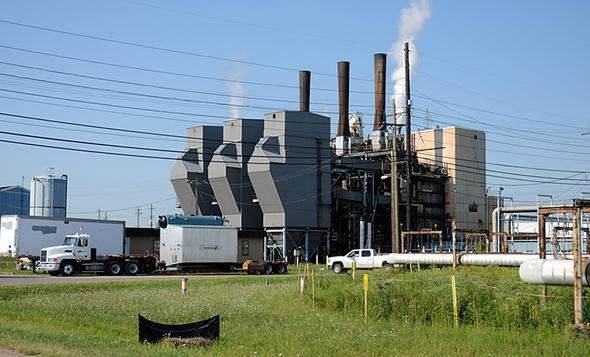 A new natural gas-fired steam plant will replace an older coal-fired steam plant shown here. The new plant has the capacity to heat buildings at the Portsmouth site much more efficiently than the old coal-fired steam plant. The Portsmouth site includes the Portsmouth Gaseous Diffusion Plant, which provided uranium enrichment services for the Department of Defense and the nuclear power industry for more than 50 years. The plant moved to cold shutdown status in 2004 and DOE is working with contractors to prepare a plan for decontamination and decommissioning of the former enrichment facilities. CARLSBAD, N.M. – Recently, Waste Isolation Pilot Plant (WIPP) carriers, Visionary Solutions LLC and CAST Specialty Transportation Inc., equipped their trucks with new safety systems to further improve the WIPP transportation system. The DOE Carlsbad Field Office (CBFO) National TRU Program's (NTP) remarkable record of safety for transporting transuranic (TRU) waste to WIPP is the result of a world-class transportation team. The success of the NTP transportation program, which relies on the expertise of waste characterization experts, packaging engineers, emergency preparedness trainers, preventive maintenance teams and highly skilled drivers, is also enhanced by developments in technology. One new feature installed by the carriers is a lane departure system. Sensors mounted on the front of the trucks detect road stripes on either side of the driving lane. In the event drivers may deviate from a lane, they will be alerted by a jarring sound similar to driving over rumble strips, which are the corrugated strips on roadway shoulders. If a driver crosses the stripe on the right, the sound is emitted from the passenger’s side of the tractor. If a driver goes too far to the left, the sound is heard on the driver’s side. The system also assures that drivers use turn signals when changing lanes or, literally, they will hear about it. 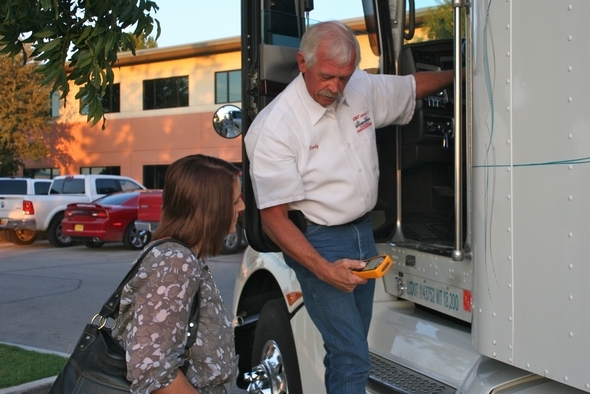 Randy Anderson, a CAST Specialty Transportation Inc. driver, demonstrates the new hand-held Zonar system used to perform truck and trailer inspections at a September WIPP transportation exhibit in Carlsbad. Visionary Solutions’s new tractors feature anti-collision systems. The forward facing radar system detects distance between the truck and the vehicle ahead of it in addition to the speed of the vehicle ahead. If the distance falls below set safety parameters, the system will automatically begin to decelerate the truck. Drivers emphasize that the truck will continue to decelerate even if the accelerator is used. CAST Specialty Transportation equipped its trucks with new electronic inspection systems that will save drivers time in completing post-trip paperwork. WIPP drivers, who are required to stop every three hours or 150 miles en route to inspect the tractor and trailer, must complete checklists and record the conditions they observe. Now with 10 radio-frequency identification (RFID) tags installed along the truck and trailer, the driver can use a hand-held scanner that reads each RFID. As the RFID is scanned, it prompts a specific checklist, and the date, time and duration of the inspection is recorded. Once the inspection is completed and the driver returns the hand-held scanner to its charging base, the information is automatically uploaded to corporate offices. Drivers have safely delivered more than 10,700 waste shipments to WIPP for disposal and logged over 12.8 million loaded miles to clean up the nation’s defense legacy waste from the Cold War. TRU waste cleanup has been completed at 22 sites in 14 states. AIKEN, S.C. – The Saltstone Facilities at the Savannah River Site (SRS) have restarted operations following a nine-month planned improvement outage. Improvements to the facilities are expected to provide a new and more reliable system to process larger amounts of decontaminated salt solution needed for future tank closure operations. Saltstone processes and disposes of decontaminated salt solution, reducing the risk to the environment from wastes stored in aging tanks. Terrel Spears, Assistant Manager for Waste Disposition Project, DOE-Savannah River Operations Office, said Saltstone must operate reliably. SRR is the liquid waste contractor at SRS. Savannah River Remediation employees install new equipment in the Saltstone Process Room during the recent outage. The improvement outage, called Enhanced Low Activity Waste Disposal (ELAWD), began in December 2011, and culminated a year when the facility processed nearly 1.5 million gallons of waste. Since beginning operations in June 1990, Saltstone has processed over 10 million gallons of low-level salt waste. For fiscal year 2012, which ends this month, the improved facilities will process more than 800,000 gallons of salt waste. During ELAWD, new production equipment and process lines were added in an upgraded process room, which will improve the production facility’s mixing and waste transfer system. The new transfer system will send a cement-like grout powder to a large mixer, where the cement substance is mixed with the low-level salt waste. From there, the material will go to a small surge tank called a hopper, which was redesigned as part of the enhancements to provide more efficient control and monitoring of the production process. 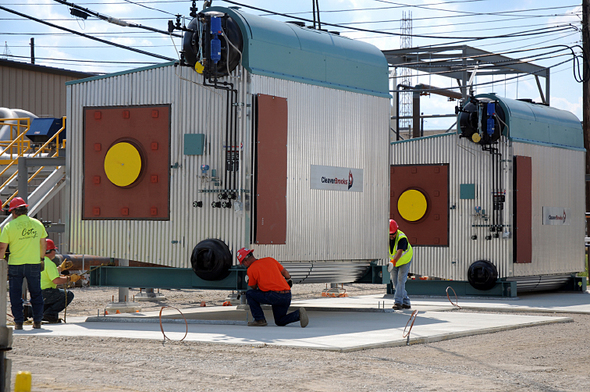 Saltstone facilities will experience less downtime between runs because system improvements were made to eliminate the buildup and solidification of grout inside the system, something that causes the facilities to be in an outage for four to six weeks, according to Dave Olson, SRR President and Project Manager. The nearly $8 million in improvements will position the Saltstone facilities for continuous operations, allowing for processing and disposal of up to 12 million gallons of salt solution per year when the Salt Waste Processing Facility begins operations.